For those of us at the level 50 PvP game, there are only two real options for fun and challenging PvP, Warzones and Ilum. Warzones are instanced encounters with up to 8 of the opposing faction, or perhaps your faction if you happen to get Huttball. Ilum is a World PvP area that has five “Assaults” or points that can be captured for Valor buffs. Around the Central Assault, there are also boxes of armaments, which can be picked up in lieu of killing opponents for the PvP daily and weekly for Ilum. Believe me though, you will attract attention just by picking up boxes. The respawn rate is rather low, so you will be competing with everyone there for them. There is one problem with Ilum that rears its ugly head quite a bit. There is faction imbalance; specifically, there are way more Imperials than Republic players. 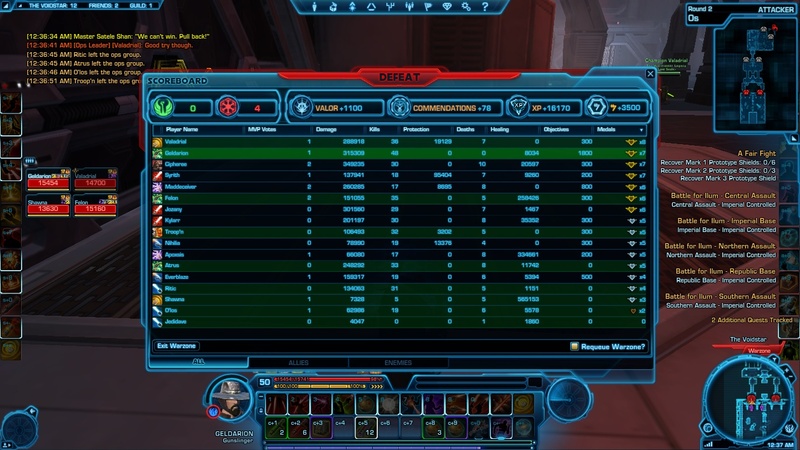 Just showing your Republic face near Central usually results in getting it smashed in by 5 Imps. You may think that guy is alone, but attack him, and he will call in reinforcements that will make very short work of you. On my server, Lord Praven (which granted is a PvE server), there are about 25 Reps on at peak times, while there are only 8 on at off-peak times. I think there may be 25 Imps on at off-peak times, though I may be exaggerating because that is just how it seems. 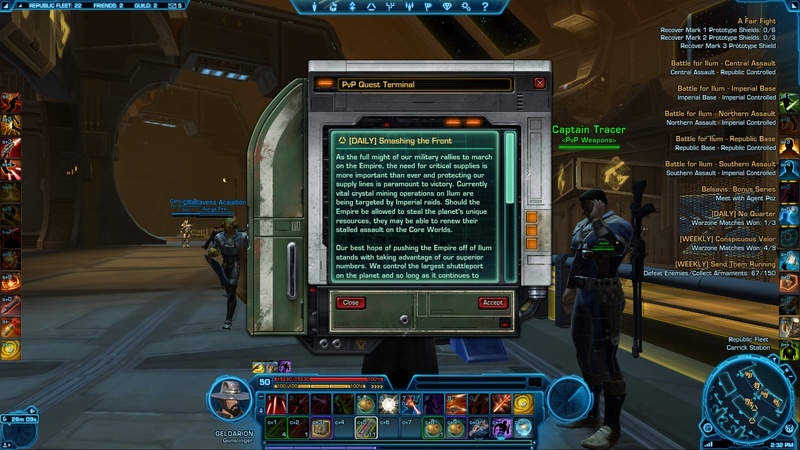 From the actual quest text for the Republic Ilum daily, Smashing The Front. I find it highly ironic. This can help soothe a lot of pains, as you can get together with friends, and it is as they say, there is strength in numbers. Off-peak hours for my server is in the morning, around 9 AM CST. Unfortunately, I don’t get to play at that time very often. While Bioware can’t balance Ilum quite yet, players have figured out how to. On Lord Praven, we have started Saturday Fight Night, which is where we get together with friends from the Imperial side at Central, and we chat while challenging each other to duels to the death. Healers from both sides rez the fallen, and we learn from each other without the annoyance of running back from the rez. Also, a LOT less lag than with full-on raid vs. raid stuff. No zergs to be seen at all. One thing that should be considered is the Valor buff. The fairest way to do this is to have one side own Central, which is where you are fighting, and the other side owns the other four Assaults. Since the side that owns Central will get a “Defender” Valor buff, the bonuses come out about equal. This is much harder to do on a consistent basis than the above tricks, but it can work. If you know some people that you have played Warzones with, then this works even better if you get a group going with some trusted allies, then pick up as many as you can at the Fleet. When soloing myself, I tend to move around the map quite a bit, instead of just staying at Central and getting mowed down time after time. I will take an Assault, then wait for someone to come take it back. I will ambush them and stop them from getting the Assault, and then I get a 1v1, which is a lot more fun. Sometimes, they bring friends, but luckily it is rare enough that I don’t usually have to worry about that. I hope some of these help you on Ilum. With the patch coming tonight with 1.1.5, there might not be much to do on Ilum anymore, but there is still Valor to be had and the fun of World PvP. Good luck, and may the Force be with you.